Associated with industrialism and capitalism, the 19th century looms large in the history of economic policy and economic thought. The beginning of the 19th century was dominated by classical economists, who concerned themselves with the transformation brought by the Industrial Revolution including rural depopulation, precariousness, poverty, and apparition of a working class. Karl Marx’s combination of political theory, represented in the Communist Manifesto and the dialectic theory of history inspired by Friedrich Hegel, provided a revolutionary critique of capitalism as he saw it in the 19th century. In the 1860’s, a revolution took place in economics. This current of thought was not united. There were three main schools working independently. As the century most associated with industrialization and capitalism in the West, the 19th century looms large in the history of economic policy and economic thought. The beginning of the 19th century was dominated by “classical economists,” a group not actually referred to by this name until Karl Marx. One unifying part of their theories was the labor theory of value, contrasting to value deriving from a general equilibrium of supply and demand. These economists had seen the first economic and social transformation brought by the Industrial Revolution: rural depopulation, precariousness, poverty, and apparition of a working class. They wondered about the population growth because the demographic transition had begun in Great Britain at that time. They also asked many fundamental questions about the source of value, the causes of economic growth, and the role of money in the economy. They supported a free-market economy. They argued that it was a natural system based upon freedom and property. However, these economists were divided and did not make up a unified group of thought. A notable current within classical economics was the under-consumption theory, as advanced by the Birmingham School and Malthus in the early 19th century. The theory argued for government action to mitigate unemployment and economic downturns. It was an intellectual predecessor of what later became Keynesian economics in the 1930’s. Just as the term “mercantilism” had been coined and popularized by its critics like Adam Smith, so was the term “capitalism” or Kapitalismus used by its dissidents, primarily Karl Marx. Karl Marx (1818–1883) was, and in many ways still remains, the pre-eminent socialist economist. His combination of political theory represented in the Communist Manifesto and the dialectic theory of history inspired by Friedrich Hegel provided a revolutionary critique of capitalism as he saw it in the 19th century. The socialist movement that he joined had emerged in response to the conditions of people in the new industrial era and the classical economics which accompanied it. He wrote his magnum opus Das Kapital at the British Museum’s library. 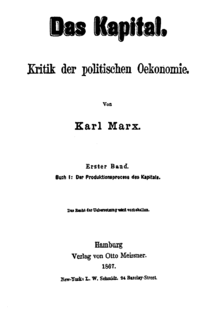 Das Kapital: Karl Marx’s definition and popularizing of the term “capitalism” or Kapitalismus, as defined in “Das Kapital,” first published in 1867, remains one of the most influential works on the subject to this day. In the 1860’s, a revolution took place in economics. The new ideas were that of the Marginalist school. Writing simultaneously and independently, a Frenchman (Léon Walras), an Austrian (Carl Menger), and an Englishman (Stanley Jevons) were developing the theory that had some antecedents. Instead of the price of a good or service reflecting the labor that has produced it, it reflected the marginal usefulness (utility) of the last purchase. This meant that in equilibrium, people’s preferences determined prices including, indirectly, the price of labor. This current of thought was not united. There were three main schools working independently. The Lausanne school, whose two main representatives were Walras and Vilfredo Pareto, developed the theories of general equilibrium and optimality. The main written work of this school was Walras’ Elements of Pure Economics. The Cambridge school appeared with Jevons’ Theory of Political Economy in 1871. This English school developed the theories of the partial equilibrium and insisted on markets’ failures. The main representatives were Alfred Marshall, Stanley Jevons, and Arthur Pigou. The Vienna school was made up of Austrian economists Menger, Eugen von Böhm-Bawerk, and Friedrich von Wieser. They developed the theory of capital and tried to explain the presence of economic crises. It appeared in 1871 with Menger’s Principles of Economics. The Progressive Era was one of general prosperity after the Panic of 1893; a severe depression that ended in 1897. Discuss the economic policies of the Progressive Era in the United States. The weakened economy and persistent federal deficits led to changes in fiscal policy including the imposition of federal income taxes on businesses and individuals and the creation of the Federal Reserve System. The progressives voiced the need for government regulation of business practices to ensure competition and free enterprise. By the turn of the century, a middle class had developed that was leery of both the business elite and the radical political movements of farmers and laborers in the Midwest and West. laissez-faire: an economic environment in which transactions between private parties are free from tariffs, government subsidies, and enforced monopolies with only enough government regulations sufficient to protect property rights against theft and aggression. The Progressive Era was one of general prosperity after the Panic of 1893; a severe depression that ended in 1897. The Panic of 1907 was short and mainly affected financiers. However, Campbell (2005) stresses the weak points of the economy in 1907–1914, linking them to public demands for more progressive interventions. The Panic of 1907 was followed by a small decline in real wages and increased unemployment, with both trends continuing until World War I. This resulted in stress on public finance and impacted the Wilson administration’s policies. The weakened economy and persistent federal deficits led to changes in fiscal policy, including the imposition of federal income taxes on businesses and individuals and the creation of the Federal Reserve System. Government agencies were also transformed in an effort to improve administrative efficiency. In the Gilded Age (late 19th century) the parties were reluctant to involve the federal government too heavily in the private sector, except in the area of railroads and tariffs. In general, they accepted the concept of laissez-faire, which was doctrine opposing government interference in the economy except to maintain law and order. This attitude started to change during the depression of the 1890’s when small business, farm, and labor movements began asking the government to intercede on their behalf. By the turn of the century, a middle class had developed that was leery of both the business elite and the radical political movements of farmers and laborers in the Midwest and West. The progressives voiced the need for government regulation of business practices to ensure competition and free enterprise. Congress enacted a law regulating railroads in 1887 (the Interstate Commerce Act) and one preventing large firms from controlling a single industry in 1890 (the Sherman Antitrust Act). However, these laws were not rigorously enforced until 1900 to 1920, when Republican President Theodore Roosevelt (1901–1909), Democratic President Woodrow Wilson (1913–1921), and others sympathetic to the views of the Progressives came to power. Many of today’s U.S. regulatory agencies were created during these years including the Interstate Commerce Commission and the Federal Trade Commission. Muckrakers were journalists who encouraged readers to demand more regulation of business. Upton Sinclair’s The Jungle (1906) was influential and persuaded America about the supposed horrors of the Chicago Union Stock Yards (though Sinclair himself never visited the site); a giant complex of meat processing that developed in the 1870’s. The federal government responded to Sinclair’s book and The Neill-Reynolds Report with the new regulatory Food and Drug Administration. Ida M. Tarbell wrote a series of articles against Standard Oil, which was perceived to be a monopoly. This affected both the government and the public reformers. Attacks by Tarbell and others helped pave the way for public acceptance of the breakup of the company by the Supreme Court in 1911. 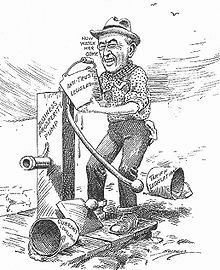 Anti-Trust Legislation: President Wilson uses tariff, currency, and anti-trust laws to prime the pump and get the economy working. When Democrat Woodrow Wilson was elected President with a Democratic Congress in 1912, he implemented a series of progressive policies in economics. In 1913, the 16th Amendment was ratified and a small income tax was imposed on high incomes. The Democrats lowered tariffs with the Underwood Tariff in 1913, although its effects were overwhelmed by the changes in trade caused by the World War that broke out in 1914. Wilson proved especially effective in mobilizing public opinion behind tariff changes by denouncing corporate lobbyists, addressing Congress in person in highly dramatic fashion, and staging an elaborate ceremony when he signed the bill into law. Wilson helped end the long battles over the trusts with the Clayton Antitrust Act of 1914. He managed to convince lawmakers on the issues of money and banking by the creation in 1913 of the Federal Reserve System, a complex business-government partnership that to this day dominates the financial world. In 1913, Henry Ford adopted the moving assembly line, with each worker doing one simple task in the production of automobiles. Taking his cue from developments during the progressive era, Ford offered a very generous wage—$5 a day—to his (male) workers. He argued that a mass production enterprise could not survive if average workers could not buy the goods. The New Deal was a series of economic programs enacted in the United States between 1933 and 1936 in response to the Great Depression. The programs focused on what historians call the “3 Rs”: Relief, Recovery, and Reform. The New Deal produced a political realignment. By 1942–43 the Conservative Coalition had shut down relief programs such as the WPA and CCC and blocked major liberal proposals. political realignment: Realigning election (often called a critical election or political realignment) is a term from political science and political history describing a dramatic change in the political system. economic depression: In economics, a depression is a sustained, long-term downturn in economic activity in one or more economies. It is a more severe downturn than a recession, which is seen by some economists as part of the modern business cycle. The Great Depression was a severe worldwide economic depression in the decade preceding World War II. It was the longest, most widespread, and deepest depression of the 20th century. In the 21st century, the Great Depression is commonly used as an example of how far the world’s economy can decline. The depression originated in the U.S., after the fall in stock prices that began around September 4, 1929, and became worldwide news with the stock market crash of October 29, 1929 (known as Black Tuesday). Cities all around the world were hit hard, especially those dependent on heavy industry. Construction was virtually halted in many countries. Farming and rural areas suffered as crop prices fell by approximately 60%. Facing plummeting demand with few alternate sources of jobs, areas dependent on primary sector industries such as cash cropping, mining, and logging suffered the most. Some economies started to recover by the mid-1930s. In many countries, the negative effects of the Great Depression lasted until the end of World War II. Great Depression in Unemployment: Unemployment rate in the US 1910–1960, with the years of the Great Depression (1929–1939) highlighted; accurate data begins in 1939. 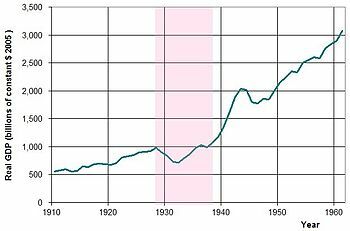 Great Depression in GDP: USA annual real GDP from 1910 to 1960, with the years of the Great Depression (1929–1939) highlighted. The New Deal was a series of economic programs enacted in the United States between 1933 and 1936. The programs were in response to the Great Depression, and focused on what historians call the “3 Rs”: Relief, Recovery, and Reform. That is, Relief for the unemployed and poor; Recovery of the economy to normal levels; and Reform of the financial system to prevent a repeat depression. The New Deal produced a political realignment, making the Democratic Party the majority (as well as the party that held the White House for seven out of nine Presidential terms from 1933 to 1969). Its basis was liberal ideas, the white South, traditional Democrats, big city machines, and the newly empowered labor unions and ethnic minorities. The Republicans were split, with conservatives opposing the entire New Deal as an enemy of business and growth, and liberals accepting some of it and promising to make it more efficient. The realignment crystallized into the New Deal Coalition that dominated most presidential elections into the 1960s, while the opposing Conservative Coalition largely controlled Congress from 1937 to 1963. From 1934 to 1938, Roosevelt was assisted in his endeavors by a “pro-spender” majority in Congress. Many historians distinguish a “First New Deal” (1933–34) and a “Second New Deal” (1935–38), with the second one being more liberal and more controversial. It included a national work program, the Works Progress Administration (WPA), which made the federal government by far the largest single employer in the nation. The “First New Deal” (1933–34) dealt with diverse groups, from banking and railroads to industry and farming, all of which demanded help for economic survival. The Federal Emergency Relief Administration, for instance, provided $500 million for relief operations by states and cities, while the short-lived CWA (Civil Works Administration) gave localities money to operate make-work projects in 1933-34. The “Second New Deal” in 1935–38 included the Wagner Act to promote labor unions, the Works Progress Administration (WPA) relief program, the Social Security Act, and new programs to aid tenant farmers and migrant workers. The final major items of New Deal legislation were the creation of the United States Housing Authority and Farm Security Administration, both in 1937, and the Fair Labor Standards Act of 1938, which set maximum hours and minimum wages for most categories of workers. The economic downturn of 1937–38, and the bitter split between the AFL and CIO labor unions, led to major Republican gains in Congress in 1938. Conservative Republicans and Democrats in Congress joined in the informal Conservative Coalition. By 1942–43 they shut down relief programs such as the WPA and CCC and blocked major liberal proposals. Roosevelt himself turned his attention to the war effort, and won reelection in 1940 and 1944. The Supreme Court declared the National Recovery Administration (NRA) and the first version of the Agricultural Adjustment Act (AAA) unconstitutional, although the AAA was rewritten and then upheld. As the first Republican president elected after FDR, Dwight D. Eisenhower (1953–61) left the New Deal largely intact, even expanding it in some areas. In the 1960s, Lyndon B. Johnson’s Great Society used the New Deal as inspiration for a dramatic expansion of liberal programs, which Republican Richard M. Nixon generally retained. After 1974, however, the call for deregulation of the economy gained bipartisan support. The New Deal regulation of banking (Glass–Steagall Act) was suspended in the 1990s. Many New Deal programs remain active, with some still operating under the original names, including the Federal Deposit Insurance Corporation (FDIC), the Federal Crop Insurance Corporation (FCIC), the Federal Housing Administration (FHA), and the Tennessee Valley Authority (TVA). The largest programs still in existence today are the Social Security System and the Securities and Exchange Commission (SEC). Social policy refers to guidelines, principles, legislation and activities that affect the living conditions conducive to human welfare. Social policy aims to improve human welfare and to meet human needs for education, health, housing, and social security. Important areas of social policy are the welfare state, social security, unemployment insurance, environmental policy, pensions, health care, social housing, social care, child protection, social exclusion, education policy, crime, and criminal justice. With regard to economic policy, regulations may include central planning of the economy, remedying market failure, enriching well-connected firms, or benefiting politicians. Informal social control is often not sufficient in a large society in which an individual can choose to ignore the sanctions of an individual group, leading to the use of formal, usually government control. social policy: Social policy primarily refers to guidelines, principles, legislation, and activities that affect the living conditions conducive to human welfare. Social policy aims to improve human welfare and to meet human needs for education, health, housing and social security. Important areas of social policy are the welfare state, social security, unemployment insurance, environmental policy, pensions, health care, social housing, social care, child protection, social exclusion, education policy, crime, and criminal justice. The term ‘social policy’ can also refer to policies which govern human behavior. In the United States, the term ‘social policy’ may be used to refer to abortion and the regulation of its practice, euthanasia, homosexuality, the rules surrounding issues of marriage, divorce, adoption, the legal status of recreational drugs, and the legal status of prostitution. With regard to economic policy, regulations may include central planning of the economy, remedying market failure, enriching well-connected firms, or benefiting politicians. In the U.S., throughout the 18th and 19th centuries, the government engaged in substantial regulation of the economy. In the 18th century, the production and distribution of goods were regulated by British government ministries over the American Colonies. Subsidies were granted to agriculture and tariffs were imposed, sparking the American Revolution. The United States government maintained high tariffs throughout the 19th century and into the 20th century, until the Reciprocal Trade Agreement was passed in 1934 under the Franklin D. Roosevelt administration. Other forms of regulation and deregulation came in waves: the deregulation of big business in the Gilded Age, which led to President Theodore Roosevelt’s trust busting from 1901 to 1909; more deregulation and Laissez-Faire economics in the 1920’s, which was followed by the Great Depression and intense governmental regulation under Franklin Roosevelt’s New Deal; and President Ronald Reagan’s deregulation of business in the 1980s. The Seal of the SEC: Seal of the U.S. Securities and Exchange Commission. Deregulation is the act or process of removing or reducing state regulations. The stated rationale for deregulation is often that fewer and simpler regulations will lead to a raised level of competitiveness, therefore higher productivity, more efficiency and lower prices overall. Opposition to deregulation usually involves apprehension regarding environmental pollution and environmental quality standards (these issues are protected against by certain regulations, such as those that limit the use of hazardous materials), financial uncertainty, and constraining monopolies. Regulatory reform is a parallel development alongside deregulation. Deregulation can be distinguished from privatization, because privatization involves taking state -owned service providers into the private sector. deregulation: The process of removing constraints, especially government-imposed economic regulations. privatization: The transfer of a company or organization from government to private ownership and control. The rationale for deregulation, as it is often phrased, is that fewer and simpler regulations will lead to a raised level of competitiveness between businesses, which itself will generate higher productivity, higher efficiency and lower prices. The Financial Times Lexicon states that deregulation, in the sense of a substantial easing of government restrictions on industry, is normally justified in order to promote competition. Opposition to deregulation usually stems from concerns regarding environmental pollution and environmental quality standards, both of which are protected against by certain types of regulations, such as those that limit the ability of businesses to use hazardous materials. Opposition has also stemmed from fears that a free market, without protective regulations, would become financially unstable or controlled by monopolies. Regulatory reform is a parallel development alongside deregulation. Regulatory reform refers to efforts, by the government, to review regulations with a view towards minimizing them, simplifying them, and making them more cost effective. Such efforts, given impetus by the Regulatory Flexibility Act of 1980, are embodied in the U.S. Office of Management and Budget ‘s Office of Information and Regulatory Affairs, and the United Kingdom’s Better Regulation Commission. Cost-benefit analysis is frequently used in such reviews. Another catalyst of reform has been regulatory innovations (such as emissions trading), usually suggested by economists..
Deregulation can be distinguished from privatization, because privatization involves moving state-owned service providers into the private sector. Many industries in the United States became regulated by the federal government in the late 19th and early 20th century. Entry to some markets was restricted to stimulate and protect private companies as they made initial investments into an infrastructure that provided essential public services, such as water, electric and communications utilities. Because the entry of competitors was highly restricted, monopoly situations were created. The government responded by instituting more regulations, this time price and economic controls aimed at protecting the public from these monopolies. Other forms of regulation were motivated by what was seen as the corporate abuse of the public interest by businesses that already existed. This occurred with the railroad industry following the era of the so-called “robber barons”. In the first instance, as markets matured to a point where several providers could be financially viable offering similar services, prices determined by that ensuing competition were seen as more economically efficient than those set by the regulatory process. Under these conditions, deregulation became attractive. One phenomenon that encouraged deregulation was the fact that regulated industries often controlled the government regulatory agencies and used them to serve the industries’ interests. Even when regulatory bodies started out functioning independently, a process known as regulatory capture often saw industry interests come to dominate those of the consumer. A similar pattern has been observed within the deregulation process itself, which is often effectively controlled by the regulated industries through lobbying the legislative process. Such political forces, however, exist in many other forms for other special interest groups. After a several decade hiatus, deregulation gained momentum in the 1970s, influenced by research at the University of Chicago and the theories of Ludwig von Mises, Friedrich von Hayek, and Milton Friedman, among others. Two leading ‘think tanks’ in Washington, the Brookings Institution and the American Enterprise Institute, were also active, holding seminars and publishing studies that advocated deregulatory initiatives throughout the 1970s and 1980s. Alfred E. Kahn played an unusual role, because he published as an academic and also participated in the Carter Administration’s efforts to deregulate transportation. 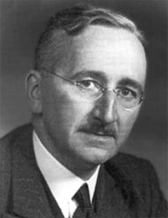 Friedrich Von Hayek: Austrian economist Friedrich von Hayek, along with University of Chicago economist Milton Friedman are two classic liberal economists attributed with the return of laissez-faire economics and deregulation. The deregulation movement of the late 20th century had substantial economic effects and engendered substantial controversy.